On August 22, 2017, The Director of NAM CSSTC, H.E. Prianti Gagarin Djatmiko-Singgih hosted a coordination meeting with the relevant Directorates of MOFA. They are Director of Technical Cooperation, Secretary for the Directorate General of Multilateral Cooperation, Director of Socio-Cultural Cooperation of ASEAN, Director of Economic Development and Environment, Director of Human Rights and Humanity, representatives of the Directorate of Inter-Regional Cooperation of Asia-Pacific. The Meeting discussed the mechanism of coordination between NAM CSSTC and MOFA within the framework of south-south cooperation, the need for monitoring and evaluation of the existing cooperation and the importance of the ‘political dividend’ of the past cooperation as well as for prioritizing of the beneficiary countries based on the existing indicators and criteria for 2017 and 2018 program activities. a. 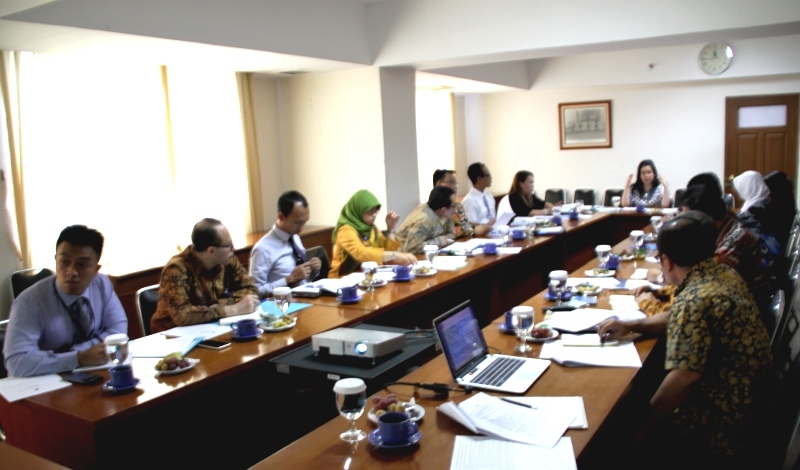 To conduct regular coordination meeting as a mechanism for creating a common guideline for south-south cooperation. The next meeting will be hosted by the Directorate of Technical Cooperation. b. The Secretariat General of the Multilateral Cooperation will share the list of the beneficiary developing countries which have already received the Indonesian aids. Other relevant directorates of MOFA are going to prepare a list of potential experts as reference for capturing demand exercise. c. Each member of SSC (South-South Cooperation) Working Group shall coordinate activities that can be synergized so as to make the program and budget more efficient and effective.